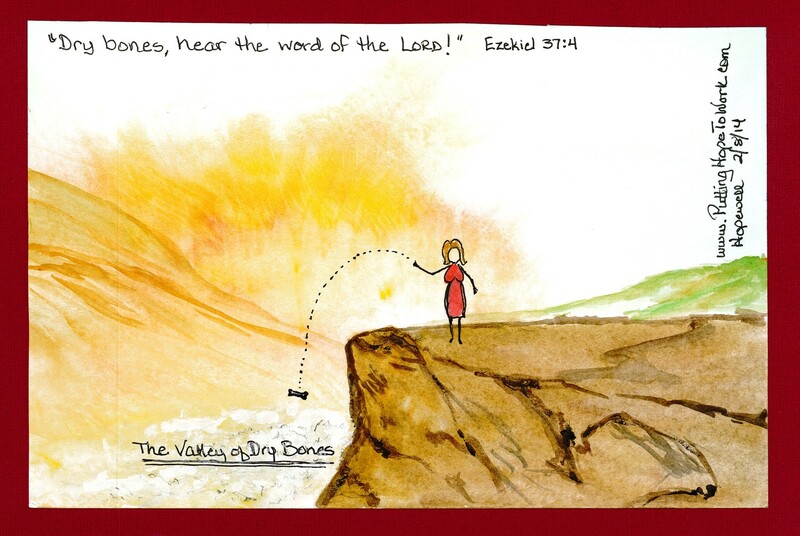 Do you have a ‘valley of dry bones’ in your life? Passions and aspirations that once inspired you but are now dead and decomposed, their sun-bleached bones discarded into the dump heap? I do! Over the years, I’ve had many hopes and dreams that seem to come for a season (nearly overtaking me in their power and all-consuming passion), only to fade away into nothingness over time. Sometimes they were displaced by a new and more captivating dream. Sometimes I abandoned them out of discouragement, weary of chasing something that seemed to be forever out of reach. And some just plain old DIED on me, no matter what kind of emergency life-support treatment was applied! And my bone pile grew. Periodically I like to walk among those old bones (it’s important to do that from time to time) and recently, I came upon one particular bone … a bone so old that there was virtually no evidence of life left on it anymore. It made me a little sad to reflect upon the dreams I had back then, and what this bone represented. I was so sure that I heard the Lord calling me to do that thing, but …. I guess I misheard, I’ve been known to do that a time or two-hundred. But as I looked at that old bone, a most wonderful thing happened. Thank you Lord, I receive that. I think I’ll be hanging onto that bone now, lovingly tending to it until You breathe the fullness of Life into it for Your glory. Previous PostTethered to hopeNext Post911 – What’s your emergency? I love your word picture of bones per dream. It’s so true that bones never deteriorate. They can loose their muscle and flesh and but bone is there, always! Great read Jenny! Thanks for the encouragement Amy. And isn’t it awesome when the Creator of Life ‘breathes life’ (or ‘life again’) into something we thought was dead and buried? Only God can do that!! !